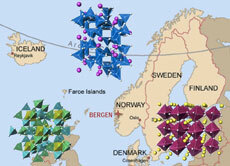 Mineralogy of Scandinavia and its closely geologically related Nordic and Baltic region had a great historical influence on the development of the mineralogical science and through it the modern materials science. From the classical rock-forming minerals, like feldspars, through specific mineralogies of pegmatites, alkaline rocks and carbonatites that span almost the whole geological history and supplied the knowledge of REE-containing phases, light-element minerals, pyrochlore and perovskite structures, to the recently active Iceland and Faroe Islands provinces with zeolites and rare fumarole minerals, the crystallographical questions, discoveries and applications related to this theme are many. We invite researchers from the broad field of mineralogy, inorganic crystallography and materials science to contribute to the scientific session. Please find the information in the attached flyer.